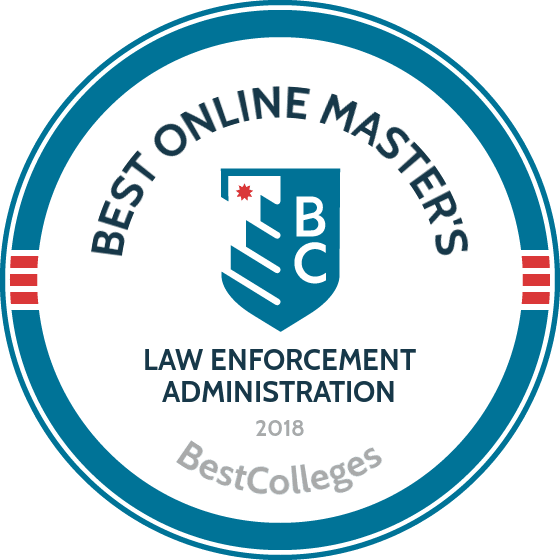 WHAT ARE THE BEST ONLINE MASTER'S IN LAW ENFORCEMENT PROGRAMS? What Can I Expect from an Online Master's in Law Enforcement Program? Designed to tackle the challenges of leadership and public administration, the best online master's in law enforcement programs prepare students for advanced opportunities in a wide range of law enforcement careers. These multidisciplinary programs cover theories of criminal justice and incident response strategies. Coursework explores real-world case studies and statistical research methods so graduates can approach any situation with critical insight and analysis. Many schools offer specializations in areas such as emergency management, corrections, cyber intelligence, and homeland security. Supervised capstone projects and internships allow students to demonstrate skills gained during their studies. Law enforcement professionals with advanced degrees earn introductory salaries ranging from $60,00 to $84,000 per year, according to the Bureau of Labor Statistics. Even experienced enforcement professionals can enhance their job prospects by earning a master's degree in law enforcement. A law enforcement administration master's degree helps professionals reach the next stage in their careers. Students learn professional legal and regulatory responsibilities, best practices of organizational management, and strategic methods of public law enforcement. An online master's in law enforcement teaches students comprehensive methods of protection and public service, while also developing leadership skills. While many applicants have military or police experience, previous work as a law enforcement agent is not required. Applicants must hold a bachelor's degree from an accredited institution. Contact each school directly for admission and application requirements. The best program for you will have strengths aligning with your career goals. Review each school's course offerings, program structure, and specializations. Choose a school that offers opportunities to develop your skills and passion, such as professional leadership or counterterrorism and intelligence. Consider the program's length and credit requirements, and communicate with admissions teams about your financial needs. CAN I WORK WHILE I COMPLETE MY ONLINE MASTER'S IN LAW ENFORCEMENT? Most online master's in law enforcement administration programs offer flexible scheduling so you can continue working. Schools understand that on-the-job experience complements classroom education. Many schools offer individual pacing so you can complete your degree based on your timeline and schedule internships around your work. Georgetown University, founded in 1789 in Washington D.C., is the oldest Catholic and Jesuit university in the United States. The MPS in applied intelligence with a concentration in law enforcement provides students with the analytical skills, predictive modeling abilities, and data-driven skills necessary to thrive within law enforcement agencies. The law enforcement concentration is one of three available at Georgetown University, the others being homeland security and competitive business intelligence. Students in the law enforcement program learn to apply their skills to fight crime and terrorism, while applying law enforcement technologies. While each of the concentrations consist of 33 credits, the only mandatory crossover classes between tracks are ethics and a capstone class. Students can blend their online law enforcement master's degree with on-campus classes, and they have the choice between full-time and part-time studies.Typical completion time averages between two and five years. Applicants must have a bachelor's degree with a 3.0 GPA and a strong mathematical foundation. Michigan University's master of science in judicial administration focuses on issues and trends in judicial policy and administration, both in the U.S. and internationally. Students can complete the 30-credit master's in law enforcement administration program in just two years. Sample course topics include national and global trends in court planning, policy analysis under conditions of change, and courthouse planning: space, technology, security, and disaster recovery. Asynchronous coursework, delivered through the Dream2Learn platform, includes weekly readings, small-group case problems, and occasional research papers. All students complete a final research-based policy analysis paper as part of their degree requirements. Students may transfer up to nine eligible, graduate-level credits with department approval. Online program tuition rates are the same for both in- and out-of-state students. Applications are submitted in February for admission in the following fall semester. Program admission requirements include minimum GRE scores (if an applicant's undergraduate GPA was less than 3.2) and three letters of recommendation. Launched in 2015, USD's online law enforcement master's degree offers in-depth study of modern criminal justice issues and delivers opportunities for students to develop management and leadership skills. This master of science in law enforcement & public safety leadership curriculum promotes a collaborative and community-based approach to shaping law enforcement policy and managing organizations. Covered topics include conflict resolution and negotiation, public safety law, multimedia communication approaches, and budgeting and resource allocation. The curriculum is contemporary and primarily skills-based. Asynchronous courses follow a year-round structure, with three 14-week terms per year. Students complete 10 seven-week courses (plus a final capstone project) online, completing the required 31 units over five semesters (20 months). Students may be eligible to transfer up to six graduate-level credits (including FBINA coursework) toward their program requirements. Tuition is $699 per unit, with a discount of $50/unit provided to law enforcement and public safety association members, active military personnel, veterans, and military spouses. Flexible payment plans allow tuition to be paid in interest-free monthly installments. 100% of the program's students are online. There is no on-campus requirement for this program. Located in Huntsville, Texas, SHSU offers innovative and career-oriented programs, including an MS in criminal justice leadership and management. This online master's in law enforcement management program is designed for mid- to upper-level criminal justice professionals seeking to advance their careers to a management-level position. As part of the application process, prospective students are required to provide evidence of current employment in the criminal justice field, with no less than three years experience in a related agency or two years experience in a leadership role. Accelerated courses last less than two months, and online students usually take two courses each semester for a total of 18 credits per year. The 36-credit program offers courses such as emergent issues in criminal justice leadership, leadership psychology in criminal justice management, and tech applications for criminal justice. Students must earn a B or better in a final capstone course to graduate. Founded in 1819, the University of Cincinnati is the oldest university in Ohio and boasts a long tradition of online educational programming. The fully online MS in criminal justice with a concentration in law enforcement has been active for 14 years. As one of three available concentrations, law enforcement students take core courses that build upon law enforcement foundations through programs like research methods and statistics in criminal justice. This concentration offers different electives, allowing students to specialize in an area of their choosing, from police effectiveness to crime prevention. The entire master's in law enforcement administration online program consists of 11 courses with a total of 33 semester hours. Typically, students take one course at a time throughout six 15-week semesters, completing the degree in two years. It is, however, possible to complete the degree in one year of full-time study. Students can shorten that time with up to nine transfer credits. The University of Cincinnati is regionally accredited by the Higher Learning Commission. National University's master's of science in homeland security and emergency management is an interdisciplinary degree that covers the latest technology and sector knowledge in homeland security, anti-terrorism, and emergency management in response to both manmade and natural disasters. The curriculum fosters a global mindset in security, as well as in managing systems, resources, and policies across all three domains. This online master's in law enforcement management program requires students to complete 54 credits, 13 1/2 of which may be transferred from qualifying courses taken at another graduate-level institution. A final mandatory capstone course, which can be completed as an individual or group, requires students to complete a project or thesis that addresses a major issue in homeland security and/or emergency management. Students can submit an online application at any time and begin their program on their own schedule. National University is a military-friendly school and, as a member of the Servicemembers Opportunity College, accepts nontraditional credit based on military experience. Wilmington's master of science in administration of justice, which can be completed entirely online, is available with concentrations in areas like leadership and administration and homeland security. Students also have the option of earning an additional post-master's certificate in homeland security to broaden their law enforcement administration job opportunities at managerial or academic levels. The program's leadership and administration track offers in-depth knowledge of managerial and administrative functions in criminal justice organizations, while the homeland security track explores pressing contemporary issues like terrorism, security management, and legal policies. The required 36 credits are composed of five core courses, four major-specific courses, and three elective courses. A thesis is optional and encouraged for those students who plan to pursue a doctorate. All course content, structured in an asynchronous format, is accessed via the Blackboard Learning Management System (LMS). Wilmington's streamlined admissions process requires only that students complete an application and submit an official transcript from an accredited bachelor's program. With its main campus located in Williamsburg, Kentucky, UC delivers a flexibly structured and affordable master's in law enforcement administration. The program is designed for students looking to enter the law enforcement field for the first time, and for criminal justice professionals who want to advance their knowledge and skills in management. UC's master of science in criminal justice administration program, specifically geared toward nontraditional students who need an asynchronous course schedule, can be completed in as little as a year with a full-time course load. All program requirements must be completed within four years of program enrollment. Students complete 18 credits of foundational coursework and can choose from 12 electives to further customize their degree, with career-specific options like family violence, corrections administration, and juvenile justice administration and management. A competitive tuition rate is offered to all online students. All criminal justice faculty at UC have years of experience in their field and most have a PhD in their area of expertise. The Colorado State University-Global Campus, founded in 2007, allows the institution in Greenwood Village, Colorado, to open its programs to students around the world. The online MS in criminal justice and law enforcement administration teaches students new law enforcement technologies, how to build community programs and policies, and how to integrate modern ethics into the workplace and community. The 36-credit online law enforcement degree occurs asynchronously for flexible scheduling. Additionally, there are 14 specializations available within the degree, including organizational leadership and change management, information technology, and human resource performance. As online students, criminal justice students receive access to numerous resources, such as the virtual library and tutoring services. Furthermore, the flat tuition rates remain for each student's study period. Colorado State University-Global Campus holds accreditation from the Higher Learning Commission. CUH's master's of science in criminal justice administration is designed for criminal justice professionals and those new to the field who are interested in pursuing career paths in local and federal law enforcement, homeland security, private investigation, parole and corrections, and law. Students in this master's in law enforcement administration program have up to five years to complete 42 credits of coursework. Average completion time for the degree is 18 to 24 months. Online courses run in a 10-week format, with students taking at least two courses per term. Courses require one weekly synchronous evening meeting, with all other asynchronous coursework accessed through the Canvas LMS. Example course topics include constitutional law, terrorism and justice, and crisis negotiations. All students must complete a final capstone course. Students who earn a cumulative GPA of 3.4 during their program may be eligible for induction into Alpha Phi Sigma, the national honor society for criminal justice. Students may also be eligible for an endowed scholarship through the university. Bellevue University is a private, nonprofit, postsecondary institution offering small class sizes and accelerated courses that allow for immediate, real-world application of learned content and skills. Appropriate for criminal justice professionals at all experience levels, Bellevue's 36-credit online master's in law enforcement management program teaches students about law enforcement at all levels, with an emphasis on crime management. Students complete their master of science in justice administration and crime management degree as part of an assigned cohort, a structure that offers opportunities to form peer relationships and seek networking opportunities. Students graduate with a range of field-specific knowledge and skills in areas like interdisciplinary research, budget development, and evaluation of the effectiveness of criminal investigations. Program admission requirements include an accredited bachelor's or master's degree, along with a minimum GPA of 2.5 in undergraduate work or 3.0 in graduate work. ASU's master of public safety leadership and administration with a concentration in executive police administration is a 33-credit online law enforcement degree that can be completed in one year. Students learn elements of law enforcement agency management and gain policy and leadership skills in public administration. ASU online courses are developed with input from experts in the field and are assessed regularly by instructional designers as part of the school's Quality Matters program. A mentored final project allows students to apply knowledge learned to real-world practice along their chosen career path. Graduates are qualified to serve in management roles within a diverse set of legal and administrative settings, including federal and tribal law enforcement agencies, child support services, and homeland security units. Graduate students have an average 90% success rate in finding a relevant job within 90 days of graduation. Competitive tuition costs are offered to all distance learners, regardless of state of residence. For more than 30 years, Saint Leo University has educated criminal justice professionals. The online MS in criminal justice offers courses in public policy-making, forensic science, and even hostage negotiations. The 36-credit degree has an enormous number of options for personalization. In addition to the 18-credit core program, students choose six electives from a list of more than 30 courses. Students may also choose a concentration out of the following options: corrections, behavioral studies, forensic science, legal studies, criminal investigation, and critical incident management. Students take a minimum of nine credits (three courses) in their concentration area, replacing electives from the general track. At Saint Leo University, online students have numerous resources at their fingertips that include a massive digital library and research assistance, professional online tutoring, student advisors, and peer mentoring. Online students also gain access to online clubs and associations. An institution with more than 160 years of educational experience, Saint Joseph's University in Philadelphia offers an MS in criminal justice with a concentration in federal law enforcement. The fully online program offers students the chance to learn how to conduct forensic financial analysis, use modern law enforcement technologies, and develop the necessary cognitive skills to excel and advance within the police force. The total online master's in law enforcement management degree typically takes 18 months to complete. As with most online programs at SJU, the 30-credit law enforcement concentration occurs asynchronously. Students gain access to online resources, such as assistance in finding law enforcement administration jobs, academic support, and the digital research library. For admission, a bachelor's degree is required, though former police and/or military service experience may be suitable. Applicants without any prior service experience should have an excellent academic record at the undergraduate level. Saint Joseph’s University holds regional accreditation from Middle States Association of Colleges and Schools. SRU's main campus is located in Newport, Rhode Island. Students in the school's master's of science in administration of justice and homeland security program can choose a concentration in either leadership in justice or cybersecurity and intelligence. Coursework in both fields focuses on theory and the underlying processes of the justice system. The 36-credit online law enforcement degree program covers core topics like public policy in the global environment and constitutional issues. To graduate, students must complete a capstone project on an emergent global or social issue in the justice system. Instruction is delivered by expert faculty, 84% of whom have a terminal degree in their field. A six-credit supervised thesis is optional. State- and federal-level internships are available for interested students. Applications requirements include two letters of professional reference and all official college transcripts. Program requirements vary by school, but the best online master's in law enforcement programs train students to apply theories of organizational management and criminal justice administration. Graduates work in a variety of public law enforcement agencies. Programs often require capstone projects or internships that blend research with real-life training. Graduate students complete general coursework in the field of criminal justice, as well as concentrated, seminar-style classes in specialized areas of law enforcement and administration. Sample courses in both formats are listed below. Police administrative policy operations: This course provides an overview of strategic administrative approaches to evaluating and resolving internal management concerns. Students learn to make decisions involving the application of law enforcement policies. Topics include management and supervision of police personnel, critical incident management, technology for law enforcement, and community-oriented policing. Research methods in criminal justice: Application of law enforcement policies requires an understanding of criminal justice statistics and conceptual data. This course exposes students to psychological and social scientific research techniques and equips students to apply this research to their work in the field. Case studies and research projects are required. Correctional leadership: Students review the history and law of correctional institutions, punishment and rehabilitation, correctional practices, and current trends. Coursework explores best practices for institutional management and offender supervision with regard to contemporary shifts in the field of corrections. Counterterrorism and intelligence: Students evaluate the concept of political terrorism in both domestic and international settings. Risk analysis is integrated with the study of intelligence gathering and best practices of counterterrorism. Cultural competency in criminal justice: This course investigates race, gender, economic, and ethnic diversity within public law enforcement. Students use qualitative and quantitative research methods to review topics such as racial profiling, bias-based policing, and disparities in the demographics of court and correctional system populations. HOW LONG DOES IT TAKE TO GET AN ONLINE MASTER'S IN LAW ENFORCEMENT? Time required to complete an online master's in law enforcement program depends on the student's transfer credits and academic status, along with the program's credit requirements. Programs typically require 30 to 36 credit hours, which full-time students complete in 18 months to 4 years. Many schools allow students to transfer in graduate credits, which can accelerate degree completion. Online master's in law enforcement administration programs are structured to support individual pacing, allowing students to complete courses on their own time. Full-time and part-time students may choose to take courses one at a time or simultaneously. In cohort-based programs, students complete coursework alongside peers. Applicants should contact schools directly for specific information on program length. When choosing a program, thoroughly review the school's accreditation standing. Accreditation signifies that a school or specific program meets standards established by the United States Department of Education (DOE). Accreditation may be granted by a regional agency or a national agency. Regional accreditation is more demanding and is therefore more highly regarded. Universities reviewing transfer credits and employers offering tuition reimbursement typically require that coursework be regionally accredited. For students, these programs are often more costly and tend to require additional humanities coursework. Nationally accredited schools often have dedicated certificate and vocational tracks, in addition to traditional degrees. While often less expensive, credits from nationally accredited institutions are typically ineligible for transfer and do not meet licensure requirements. For students seeking tuition assistance from a nonprofit organization or an employer, review reimbursement provisions to ensure your school qualifies. Professional organizations recognize schools with field or industry accreditations. Because law enforcement administration degrees may be linked to criminal justice programs, prospective students should look for accreditation from the Academy of Criminal Justice Sciences (ACJS). However, very few programs are linked to the ACJS, so candidates should focus primarily on regional or national accreditation. Alongside the DOE, the Council for Higher Education Accreditation (CHEA) oversees and catalogues the standing of universities nationwide. The CHEA advances higher education quality through its partnership with the U.S. government and educates the public on education standards. Further information regarding the demands of accreditation and a national registry of accredited institutions are available on the CHEA and DOE websites. Earning a master's degree in law enforcement online prepares students for lifelong leadership and creates a competitive résumé. Because law enforcement degrees are commonly housed within criminal justice programs, a recent report by Georgetown University's Center on Education and the Workforce is helpful for determining the degree's marketability. The study found that college graduates with no work experience and a degree in criminal justice or fire prevention had an unemployment rate of 8.4%, while graduate degree holders with experience faced only a 3.3% unemployment rate. In recent years, higher education for law enforcement professionals has become a national priority. In its 2015 recommendations, the national Task Force on 21st Century Policing included more than 10 pages dedicated to incentivizing higher education for law enforcement personnel. Because of this federal focus and graduate degree holders' enhanced employment benefits, both experienced officers and new agents benefit from higher education. Professional experience increases annual earnings for law enforcement personnel. The following chart reviews reported and expected salaries for law enforcement agents at different stages in their careers, including police lieutenants, immigration officers, and other administrative law officers. An online master's in law enforcement administration prepares candidates for an array of protective service positions. Graduates work in corrections, homeland security, local police administration, and emergency response teams. They also pursue roles as senior analysts for diverse government agencies. Jobs may demand physical agility, meticulous data review, or precise leadership of internal personnel. Police and detective supervisors coordinate criminal investigations, enforce police procedures, and manage subordinate personnel. These roles require knowledge of policing techniques, organizational leadership, employee recruitment, and public safety. Correctional supervisors maintain order, security, and discipline within correctional facilities, while overseeing the operational needs of their institutions. These positions require thorough knowledge of emergency response techniques and correctional procedures. Correctional managers demonstrate effective command leadership and hold budgeting, administration, and operational responsibilities. Fire prevention and control supervisors coordinate and oversee firefighters and fire prevention officers. Specialized education in firefighting techniques is paramount. Training, staff management, and regulatory adherence are also important skills. Emergency managers perform administrative responsibilities for communities during times of public safety crises, such as opening public shelters, ordering evacuations, and implementing emergency response procedures. They stay apprised to new techniques in public safety and disaster preparedness and coordinate with public and law enforcement agencies during emergencies. Police and detectives protect property and lives and preserve public safety. Those with advanced degrees may specialize as criminal investigators, border patrol officers, or intelligence analysts. In these roles, agents identify threats to public safety, investigate crimes, and develop procedures and responses for government agencies. As you begin earning your master's degree in law enforcement online, connecting with professional organizations will support your education and future career. Below are a few organizations for law enforcement professionals, which will help you build relationships, stay up to date on legislation, and find scholarship opportunities. This organization advocates on behalf of federal law enforcement agents. Member benefits include insurance assistance, legal defense, scholarships, and networking opportunities with local chapters. As the world's largest organization of sworn law enforcement officers, the Fraternal Order of Police sponsors initiatives to connect officers with communities and provides its members with online educational resources, legal defense, insurance and banking options, and tuition assistance opportunities. An online network for communication and support provides members with news releases and articles regarding legislation impacting their work, as well as a source of job opportunities. To finance your online master's degree, explore the scholarships and funding opportunities at your prospective schools. Online master's in law enforcement programs may offer additional funding for prior military experience, through the Yellow Ribbon program or the GI Bill. Those with police experience should contact the Fraternal Order of Police for tuition assistance information. Applicants may be eligible for private grants or scholarships through nonprofit organizations or employers. For information on federal funding opportunities, such as grants, scholarships, loans, and work-study options, complete the Free Application for Federal Student Aid (FAFSA).